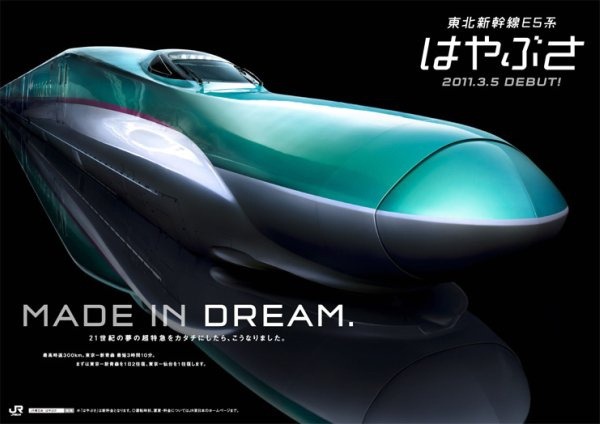 Train enthusiasts in Japan are ecstatic as East Japan Railway Company (JR East) official debuted the E5 Series Shinkansen or “Hayabusa” today which will be operating on the TÅhoku Shinkansen Line from Tokyo to Shin-Aomori with major stations like Sendai and Morioka. Hayabusa is Japanese for Peregrine Falcon, a bird that can be found in temperate climates like Japan and North America capable of reaching speeds of up to 320 km/h when diving for prey the same as the E5 Series’ top speed. The E5 Series is the first completely new shinkansen model to be introduced in over a decade and incorporates many technologies resulting from years of research and testing. The Hayabusa has sensors that detect buffeting and shaking as it cuts through the air at high speed, when enough is detected that would disturb the ride quality of passengers the train adjusts to counteract this movement. Similarly when the train is negotiating a corner at high speed it counteracts this force by pumping compressed air into special springs undercarriage which means that passengers are literally riding on air. The long nose is the most distinctive feature of the new E5 Series and its purpose is to aerodynamically minimize noise when the high speed train enters a tunnel. Jamaica doesn’t have a public passenger rail system anymore and hasn’t for a long while although the government is in talks with China on how railway services can be introduced in Jamaica. I can only dream about a sophisticated train like this being available here, well at least I’ll do my best to ride one (or all ^_^) of the bullet trains when i get to Japan later this year. Ah~ I want to ride this train so badly. I generally avoid the shinkansen because it makes me sick, but I really really really want to ride this train! Too bad I have nowhere to go that would require riding it… Thanks for this post! I have no idea when I’ll be able to catch a glimpse of this… but hopefully I’ll see it when I’m passing by Tokyo station soon! Wow. That is super fast to me. When I lived in Sendai, the fastest train they had one a steam engine train that stopped at Sendai having come from Tokyo. I rode that one a few times. It took a long time to get from Tokyo to Sendai on that train. The toilets still spilled out on the railroad tracks in those days. Quite different for we who came from America.